Import card statements for your users and reconcile submitted card expenses against this. 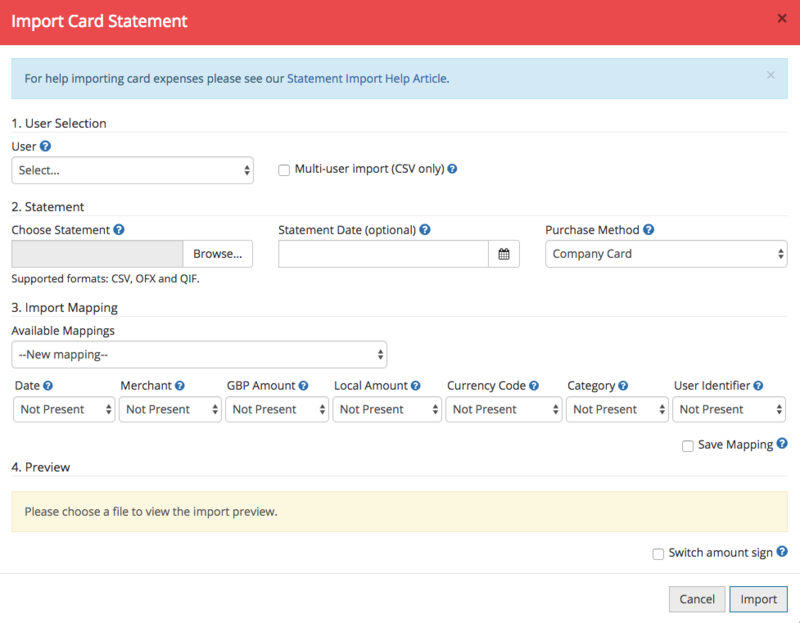 The company card import feature is great way for Finance to reconcile card expenses against imported statements. Before you get started with importing the card statement, you will need to already have your statement downloaded to your computer in either CSV, OFX or QIF format. You can download your statement from your online banking/credit card portal. Please note: If you have multiple card holders, you will want to use our multi-user import feature. This feature is only available for statements downloaded to CSV. 3. From the Import Card Statement box can select the user you want to import the card statement for. Alternatively, tick multi-user import to upload one card statement that contains all of your cardholders on it. Please note: In order to use the multi-user import feature, you will have to set statement identifiers against your users in the Admin section. 4. Click Browse to choose the statement from your computer. 5. 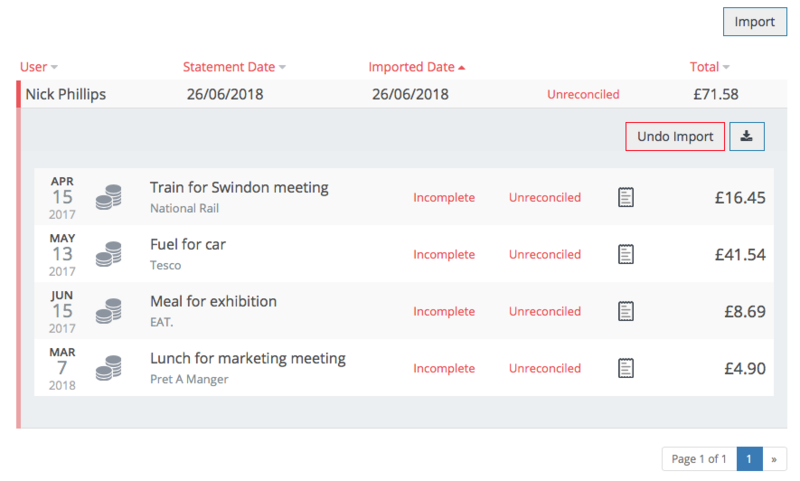 You can add an optional statement date to help better track which statement expenses belong to. 6. Choose the purchase method. 7. Check the mapping of your columns. If these need to be amended you can assign the column fields from the drop-downs. If your cardholders have used their company card abroad, you will want to import the foreign amount and currency code. This will ensure expenses are recorded in the local currency and any existing draft expenses or unattached receipts can be matched correctly. Tick Save if you would like to save the column mapping and give your saved mapping a useful name. In the preview area, you can see a preview of the expenses. 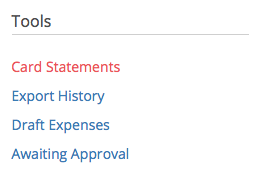 If your expenses are showing as a negative, be sure to tick Switch amount sign. Please note: If there are refunds on the statement you want to turn on negative expenses in the Advanced Settings area. When you're happy, click Import! The system will transform the imported card statement into individual expenses and send them to the corresponding user's account. If the cardholder has any matching draft expenses or unattached receipts, then these will be matched to the imported statement. The imported card statement will now reside in the Card Statement area of Finance. Initially, the card statement will show up as Unreconciled. If you need to reverse the import you can click Undo Import. Please note: Reversing the process will not delete any receipts or expenses already created by the user, even if these were matched to the import. When you mark the expenses as reconciled in the approved area, this action will reconcile the expenses against the imported card statement. 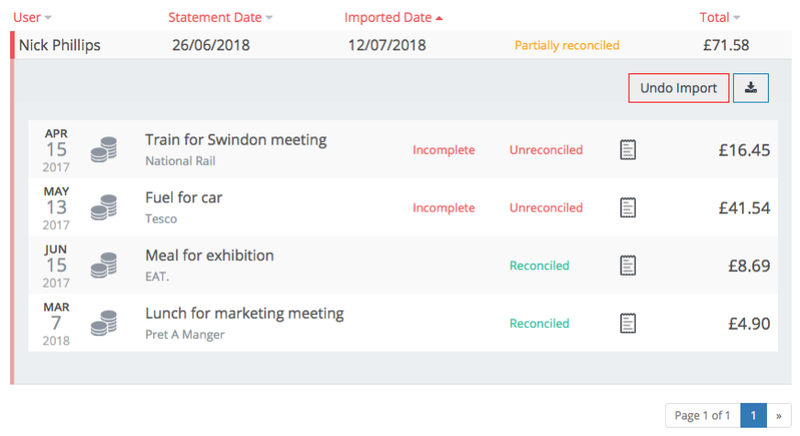 In the Card Statements area, you will be able to see which transactions have been reconciled and which ones haven't.